TimDog51, nascarfan9, Tetronix and 6 others like this. dudeman21, nascarfan9, ShadowKnight508 and 1 other person like this. nascarfan9, MrDude68 and Ceafus 88 like this. IMO, a scheme that should have never changed. Might have to buy the diecast for that one. Tetronix and joeykraus19 like this. starscream24, bvc, Ceafus 88 and 3 others like this. I think we can all agree that what Hendrick has been doing with the A-pillar is atrocious... That, being said, I think what Austin was getting at was: "Can't we all just be happy about this awesome throwback scheme instead of carrying on about the same mess that we carry on about on every other Hendrick scheme?" It's an awesome throwback - A-pillar garbage, or not. starscream24, Virox6549, bvc and 3 others like this. Also, in the video @XxTeam48LowesXx posted, I love how Jimmie is like "All I wanted to do, was win *one* race." Ceafus 88 and XxTeam48LowesXx like this. Sure it doesn't look good, but my point was more meant to say, we get it, there's a thing on the a post. It gets annoying hearing about it every time a scheme is released. Tetronix, BrendonH12, starscream24 and 1 other person like this. @XxTeam48LowesXx posted, I love how Jimmie is like "All I wanted to do, was win *one* race." Thought process is probably the same these days lol. Honestly, the A-Pillar garbage doesn't really bother me anymore. The Homestead scheme has it, but it actually fits and blends in quite nicely, and it doesn't take away from the original idea of what this scheme is and what it represents. starscream24, Virox6549, joeykraus19 and 1 other person like this. I am actually kind of sad that this will be my last time seeing the Lowe's car in person. joeykraus19 and Ceafus 88 like this. 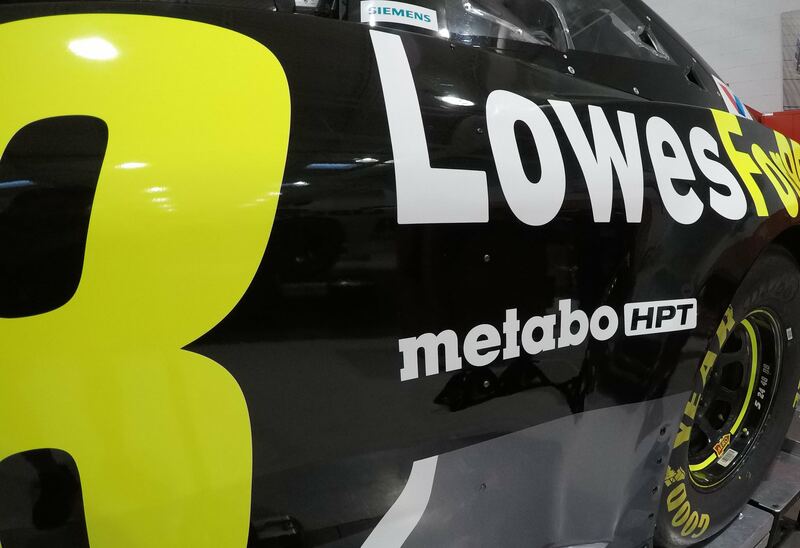 Not a new scheme, but Metabo HPT will be on the side of the car this weekend at Kansas. Credit to Team Lowe's Racing's Twitter page.